The purpose of this article is not to teach you how to do your own autograph authentication. Rather, it's meant to give a list of guidelines and resources that you can better educate yourself with. It will also help you decide the right time to get third-party autograph authentication for your items. In addition, we'll give you some common examples of problems that can occur during the autograph authentication process and offer potential solutions. It should be stated that autograph authentication is one of the most controversial and murky aspects of collecting sports memorabilia. The methods employed are far from an exact science. Most reputable authenticators, themselves, will admit that even under the best circumstances, their findings are merely an opinion. It is not concrete proof of a genuine autograph. Quite simply, the only way to ensure that the autographs in your collection are authentic is to acquire them in person. This process includes handing the item to the athlete, watching them sign it, and having the athlete hand the item back to you. That being said, there are probably items already in your collection that you would like to have authenticated. However, once you make that decision, be prepared for potential disappointment in the results. There are literally dozens of autograph authentication companies in existence today. From forensic document examiners to so-called handwriting experts, to corporate institutions like PSA/DNA and others that claim to use state-of-the-art technology with fancy sounding names like Color Spectral Deconvolution or Video Spectral Comparator, the autograph authentication choices available to a collector can get confusing. Regardless of the company, all autograph authenticators use some form of a multi-step process that includes examination and analysis of the ink and medium, object evaluation, side-by-side signature comparison, structural analysis, tagging and certifying. Has the ink permeated into the paper or does it lay on top of the paper indicating that it may have been recently applied? Is the ink used in the signature consistent with those used when the autographed was supposedly signed? Depending on what the signature is on, an entirely different set of questions must be answered. To give you an idea of the issues authenticators are dealing with at this stage, a paper document has several characteristics that must be evaluated. Older ink has acid and actually etches the paper over time. Is such etching present? Modern paper deteriorates quickly over time and becomes more brittle. Is the paper’s condition justified for the time the signature was applied? Brown mildew spots, called foxing, can appear on all paper. Is the ink on top of or underneath the foxing? 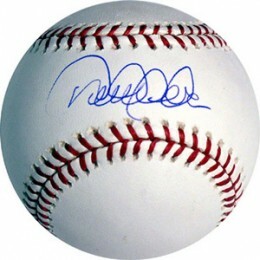 When the signed object is a piece of memorabilia like a ball, bat, jersey or other equipment, even more complex and time-consuming autograph authentication methods are used to properly age the item to the signature. By using a verified signature or even a copy of an authentic signature, the submitted signature can be compared to the exemplar. Reputable autograph authenticators have a large exemplar library, which usually contains a wide-range of samples to call upon for easy reference. Once the authentication process is complete and passed, the item is tagged. This is typically done with some form of a tamper-resistant, foil hologram label that also has a serial number. The number is then recorded in a database for future identification. In addition to the item itself being tagged, a corresponding document, called a Letter of Authenticity (LOA), is issued with a matching serial number. It often comes with a matching tamper-resistant tag as well. This is a process that uses a advanced color algorithm in 3D space to separate or remove color components. It is most often used on documents to help separate the signature from the object background color, allowing for a more detailed analysis. This hi-tech piece of equipment can be used to examine documents and autographs using sophisticated color and infrared imaging, magnification, coaxial lighting, and side lighting on-screen. 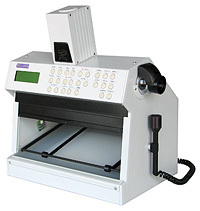 It can be used to detect erasures, reveal masked and obliterated signatures, as well as differences in ink types. As previously mentioned, there are a range of companies to choose from. A simple online search will reveal many that fall outside of what the hobby has established as reputable. In reality, even these companies have been known to make their share of mistakes given the nature of the authentication as just an opinion in the first place. Couple this with the fact that autograph authentication is a for-profit business and you can imagine the potential issue that may result. One of the most troubling things collectors encounter from time-to-time is when they submit an autograph for authentication that they have acquired in person, only to have it rejected by the authenticating company. What recourse do you have as a collector if this happens? Unfortunately the answer is, very little. As frustrating as this can be, your only options are to submit the item to another authenticator or simply be satisfied in knowing for yourself that it is genuine. While this may help when the item resides in your own collection, it certainly will make it difficult to sell the item in the future without a reputable LOA. If getting your own autographs authenticated isn’t a top priority but purchasing them from a reliable source is, there are a handful of reliable event organizers and dealers whose Certificates of Authenticity (COA) have proven to be trustworthy over the years. Autograph collecting is a fun and exciting hobby. It can also be time-consuming and expensive. Before investing in autograph authentication, educate yourself. Decide how you want to get your autographs. If you choose to get them authenticated, be prepared for the results, good or bad. Great article! Good job ! Recently I’ve been buying autographed baseball memorabilia and have been researching authenticators. Does anyone know My Favorite Players, Inc., Stacks of Plaques, or Old Time Sports? Stan Musial and Reggie Jackson. Does any one know that these are legitimate companies or fakes using the names of these players? bob111146 � Personally, I haven’t heard of those companies. That’s not to say they’re not real, but I’d use extra caution before proceeding – like we should be with any signature. Anybody had any dealings with Justin Priddy of ACE? So far I am not impressed with his follow up with me. hi…don’t know if this thread is active, but I can’t find an answer to my question/problem anywhere else: my Ted Williams / Mickey Mantle auto photo came with a PSA/DNA loa from 2006. The loa has a “reference” number instead of a certification number: the number does not appear in the PSA/DNA database. A buyer backed out because of this. I bought it framed with the loa attached to the back (it was a professional–albeit mediocre–frame job). After this experience, we removed the photo and found no PSA/DNA sticker. Any help understanding this would be appreciated…many thanks. I had Steve Kerr autograph a basketball for me but didn’t think of getting a cert of authenticity as it is a gift for my husbands boss. Can I have him sigh a letter saying it is his signature? Since I have access to him personally it seems silly to pay a company to authenticate it. Thanks for your help! Paulette Britton � If it were a notarized letter, that would likely work. Unfortunately there are people who forge certificates of authenticity so some might be concerned that the letter could be forged too in a situation like that. I just got a joe namath football authenticated by Certified Authentic Autographs INC. I cannot find any information on them. Has anyone ever heard of them? For me personally, it does not make me feel confident. It doesn’t mean the signature is fake necessarily, but if I were purchasing myself, I would be very cautious and probably want a second opinion. If you’re ever looking to sell the football, it would definitely be in your best interest to get it checked by a more reputable company like PSA/DNA or JSA. Thank you Ryan. I am a little uneasy as well. The gentleman I bought it from stated that it was signed during the Pro Am charity tournament in Kansas City that Joe and his best friend Len Dawson. Apparently CAAI is the local charities authenticator but I just have no idea how to really research it. I am slightly confused by PSA. I am not looking to sell it, but it is a christmas gift and I want to make sure it is real. I cant even find someone near me who authenticates them. once my Item is authenticated. Will I receive a Certificate of Authentication?? Jason � You should get some sort of authentication, usually in the form of a certificate. However, larger, more reputable companies like PSA/DNA also have other measures as well. How reputable is Who’s Who Productions in terms of authenticating autographs on items they sell? Fran O’Rourke � I’m not familiar with them. Personally, if I were buying, I’d want a second piece of authentication from someone like PSA or JSA to go with it. I have a lot of olympic memorabilia including stuff back to 1932 books, news paper pins etc. Is there a place in or around Portland Or. To sell them. I have a Pete Rose Baseball Bat that he used in a game in 1964, then gave to me in a meeting our ball team had with him directly after that game. I have pictures of that day when he gave me his bat. Unfortunately, I did not have him sign the bat. Only a piece of paper that was eventually lost. Is there any worth to this, or shall I just consider it a sentimental piece for myself? Just curious. Thanks for listening! PSA not always the greatest. Sent 5 baseballs, all from the same collection with several others already auth. and PSA rejected 4 out of 5 of them. Ate over $600 in PSA fees! Then sent them to JSA and all passed! It’s a crap shoot with PSA!!! Ever hear of (GOPLAY Authentics)? Can’t seem to find them on the net. Hey, I like your article. Very informative. I was wondering.. have you heard of DKJ Sports? Apparently, they also authenticate signed memorabilia, but I can’t find anything about them, even though there name is found all over eBay. I have a Ryan Braun black Sam bat. Sticker on bat but no certificate. Sticker says 010013LH. Any idea if real? Im so glad that I read your article. My common sense told me that it’s like rolling the dice to use the signature authentication companies. I just read some really bad Yelp reviews on JSA who I was leaning towards using. My husband passed away and left me with hundreds of autographed items some with certs attached and some I just have to match up. This helped me decide to just use the Certificates I have and get a price that is reasonable rather than asking for thousbands becuase I have a PSA or JSA DNA tag or letter. What about this ” Go Play” site as legit? I have noticed several Aaron Rodgers cards showing up,,, all at once,,, same year cards,but different seller names…. and none of these cards can be located in Beckett’s price guide. I’m looking for a company I can physically take some autographed baseballs I own to have them analyzed and get COAs for. I’m vary wary of shipping them off to some company. Does anyone know of a company in MD/DC/VA I can do this? I have an Ezekiel Elliott signed jersey that has a JSA LOA and the sticker ..The sticker was torn on the side. The JSA website shows the jersey. Just wondering since the sticker was ripped should I have it sent it in to JSA and have it redone with another letter from JSA. I never noticed it torn when I got it..Its not close to the numbers its by the edge. I have a Kris Bryant signed World Series jersey with “WS 2016 Champs” on it. The name and numbers on the back were sewn on at a slant and off center. Is something like this worth more or less than a jersey with the lettering in the proper place? Can i get a Signature Authenticated via E-Mail ?? So i don’t have to mail it ..
You should be able to find a local event where one of the major authenticators will be in attendance. They are at many of the comic conventions and sports card/memorabilia conventions. Is GAA a trustworthy authentication company? Please let me know everyone!!! Do you know a site/person who could do signature identification, not so much authentication. We have a football that was donated to our shop and we have no idea which pro football players signed it. It came with a note saying they were from the 90’s – 95 and that they were from various teams. Any help would be appreciated. I also would like some comments on GAA.. anyone?? You would want to reach out to PSA, JSA or Beckett to see when they will be in your area. All three are respected authenticators.